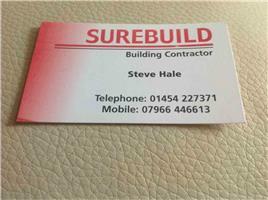 Surebuild - Builder, Roofer based in Rangeworthy, Gloucestershire. Surebuild was established in 1991. We are family based LABC business with 25 years experience. A business that specialises in new build, extensions, renovations,barn conversions, all types of boundary walls including dry stone and stone walling, patios, driveways, roofing and all general building and maintenance work. No job is too small or too large, you can rest assured that we will be both professional and competent at all times. Give us a call !